Shopping in Davao, Part 2 – Beware the Comfort Zone! Ah, yet another fun adventure yesterday! I love to shop, no secret there, and shopping here takes things to a new level in several ways. First off, there are always deals to be found, and the inventory changes almost every time you head out. Which is fun! There are always treasures to be found. Until you look for an item a second time, and find it’s been replaced. Dan had a near meltdown of toddler proportions the other day when a local store no longer carried the Kirkland (Costco) whole bean coffee that previously filled a shelf. Lesson learned, if you see something you have to have, grab it, and hang onto it for dear life! Then take it home and ration it. The other adjustment to shopping is dealing with loss prevention techniques. In short, they make it very hard for anyone to steal anything. Which is good, yes, but just plan ahead, because if you buy anything, you’re gonna be there a while. First, to enter the store, you need to pass through security, which is usually fairly quickly, the heavily armed uniformed guards check inside your bags, maybe or you down, and you’re on your way. If you have extra shopping bags from other stores, you are usually required to check them into the baggage area. Once you’re inside the promised land, you are greeted by numerous sales clerks who slowly follow you en masse, just imagine OJ Simpson’s high speed chase. For more on browsing, read Which Way to the Big and Tall Store?! So what happens when an item is too big to fit into a bag? Simple, tape the receipt to the outside, right? Yeah, this is where things get a bit more complicated. A few days ago I spontaneously stopped at a plant expo going on at another mall to look around. Several plants later, I left, mainly because my hands were full and my wallet was empty. 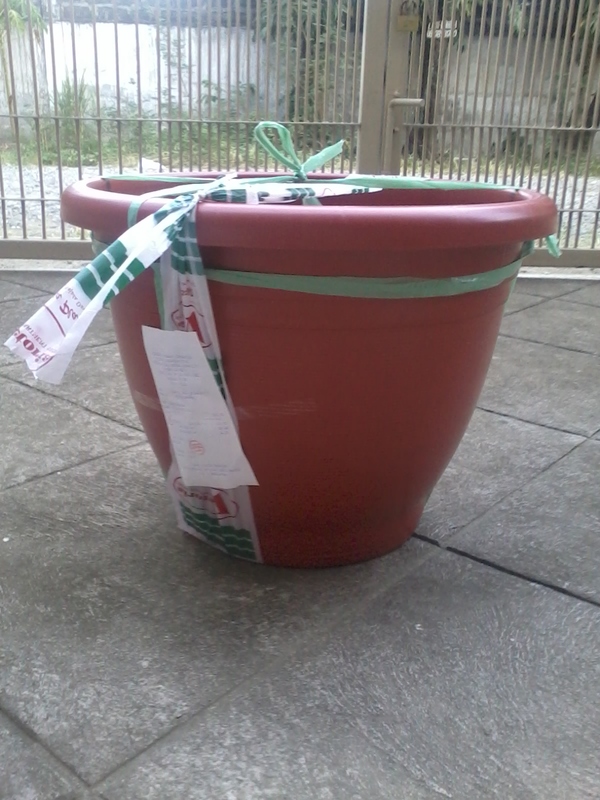 Anyways, I needed a permanent home for the adorable hibiscus bush I picked up, so I went to buy a pot. Got in, found one right away for super cheap, things were going gooood! Then, I approached the check stand. The daunting check stand that stood between me and getting out in record time. No line, sweet! The cashier took seconds to ring me up, threw the receipt in the pot and said “thank you ma’am” in a tone that implied, “our time together is done, move along!” My old habits kicked in, and I went to grab the pot and head for the door. As I reached for it though, an alarm in my head began to sound. “Danger Will Robinson! It’s a trap! Back away from the pot!” I suddenly realized, her trusty receipt signing sidekick was nowhere to be seen, but there was a random pile of stuff in her place, with a receipt conspicuously perched on top. Where was receipt girl?! I was so confused and bewildered. The receipt checker soon returned with the owner of said pile, and began to bag her stuff. Crisis averted. I don’t even want to think about what would have happened had I broken protocol. Locked Up Abroad? Hmm…I wish I were joking. So, after the customer in front of me was taken care of, it was my turn, I was still on track for a land speed shopping record. Then, to my horror, she pulled out “the twine”. Anyone who has spent anytime in the Philippines surely knows about “the twine”. Magic twine. All purpose twine. We made fun of it’s ubiquity at first, however, we have fallen victim to it’s powerful spell. “The twine” is simply made from plastic threads, we use it occasionally in the States, but it is used to secure everything here. Boxes, packages, cars, children, you name it. The receipt girl pulled out the spool of twine, and I knew my record time was over. I won’t explain how she secured my one piece pot with it, I will let the picture explain. Have you ever seen the movie Love Actually? Remember when Alan Rickman was shopping for his office mate? (yes, he plays a jerk! That doesn’t really apply here, but I felt the need to mention that) I felt like Alan Rickman, and the clerk was Rowan Atkinson. I was waiting for the sprig of holly and the chocolate buttons to appear. The plastic ribbon hanging off of it is the finishing touch to the fine packaging job, it originally has all the info on the receipt duplicated on the end it Sharpie, but the guard cuts that part off as you leave. After about 15 minutes of wrapping and tying, I was free to go. I even made it home before the plant died! Happy times! As much as I joke though, they have a good system, like I said their theft rate must be super low, it’s just one more thing to adjust to. I’ve gotten to where I just approach stores with my bag already open for inspection, just makes life run a bit smoother. I’m scared to go shoppping there now. Great! LOL! My only comfort is that you will be there with me. ‘Tis the Season… | Beware the Comfort Zone! Previous Post We Have Wheels! Next Post An Update, No Biggie!